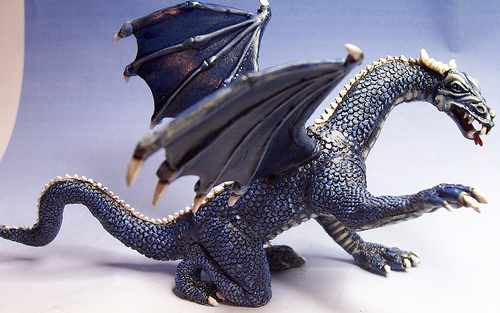 Once the base coat is dried, I liberally applied thinned dark blue ink over the entire model. Â I don’t always use inks and washes but it works well with tiny scales to easily shadow around every one of them. The ink will take a while to dry. Once it’s ready, I go over every scale individually with a mixture of the base color and a lighter color. White lightens blue nicely. Â I use thin paints and go over the model several times mixing more highlight in with the base coat. Â The last highlights are sometimes pure white. Â This depends on the size of the details and where they are positioned on the model. Â The claws, teeth, and spikes I brought up to white. 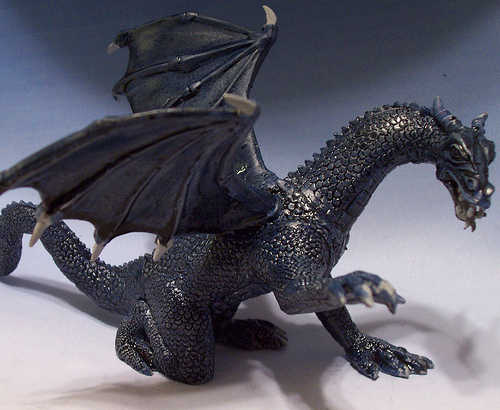 Â The Â larger belly scales and some of the details on the face got another wash of black and blue mixed together to create deeper shadows.